XML is one of the most common standards for the exchange of information. However, organizations find challenges in how to address the complexities of dealing with hierarchical data types, particularly as they scale to gigabytes and beyond. In this IBM® Redbooks® publication, we discuss and describe the new capabilities in IBM InfoSphere® DataStage® 8.5. These capabilities enable developers to more easily manage the design and processing requirements presented by the most challenging XML sources. Developers can use these capabilities to create powerful hierarchical transformations and to parse and compose XML data with high performance and scalability. Spanning both batch and real-time run times, these capabilities can be used to solve a broad range of business requirements. As part of the IBM InfoSphere Information Server 8.5 release, InfoSphere DataStage was enhanced with new hierarchical transformation capabilities called . XML Stage provides native XML schema support and powerful XML transformation functionality. These capabilities are based on a unique state-of-the-art technology that allows you to parse and compose any complex XML structure from and to a relational form, as well as to a separate hierarchical form. 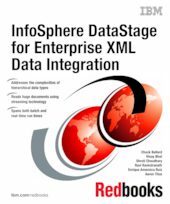 This book is targeted at an audience of systems designers and developers who focus on implementing XML integration support in their environments.